Epic (DVD, 2013) From the creators of Ice Age Combine Shipping and SAVE MONEY! It's like Twn Peaks and X-Files for kids, but adults will love it too, maybe more! I found Gravity Falls by chance on the TV one day and after a few minutes, was intrigued enough to watch a few episodes. It took no time and I was hooked, hooked enough that I wanted to have a copy of the series itself. 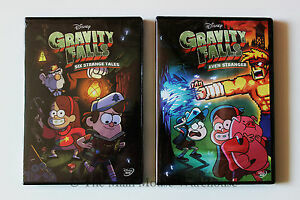 These are the first six episodes, in order, of the amazing cartoon, Gravity Falls, where strange is a daily occurrence. Laugh out loud funny, with engaging characters and deeper mysteries, if you care, or dare, to look for them. Simply Awesome! More laughs than most sitcoms, and guest voices galore. Joining a long line of excellent animation, Gravity Falls is our household's new favorite. We will be watching this disc over and over. 12 year old son loves it, glad he is almost out of the sponge bob stage.